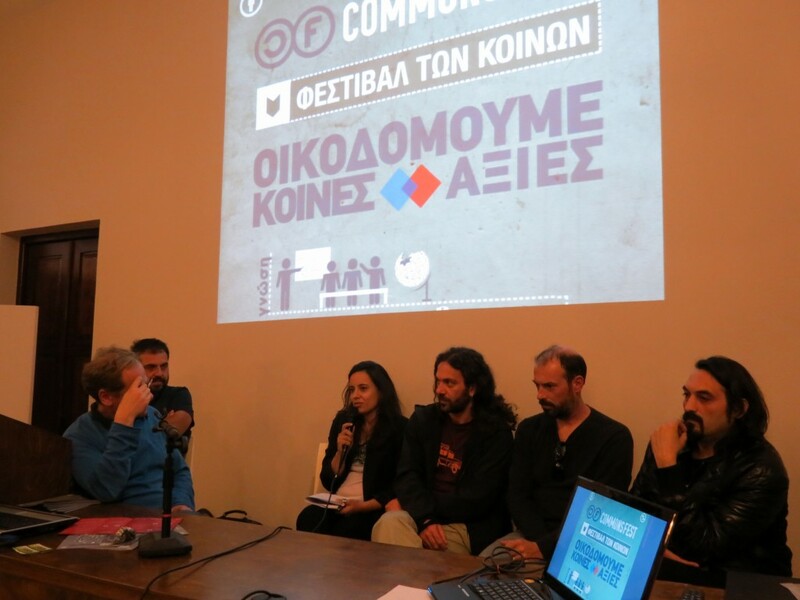 CommonsFest was held for the second consecutive year in Heraklion, Crete on May 9th ,10th and 11th. In this celebration of collaboration, solidarity and sharing took part members from eco-communities, natural farmers, seed preservationists, cooperatives and solidarity economy productive ventures and associates, participants of free software and digital rights fighters, members of community-run open wireless networks, lawyers, sociologists and political economists, scientists and academics, social activists and ordinary citizens interested in the sustainable management of the Commons. This year’s program, which was formed after then open call, included 24 talks, 9 workshops, an exhibition and a first meeting of the participating teams on building a coalition for the Commons. The festival presented projects, which come from a wide range of covering needs and management of both digital commons and natural resources, projects dealing with sustainable farming methods, the conservation of agricultural biodiversity, open broadband wireless networks, solidarity networks that provide primary health care, natural building methods, the approach of self-sufficiency through examples of home economics, alternative governance models, actions to safeguard the cultural commons, free software for the safe and effective management of information, new forms of collaborative innovation and exchange of knowledge, citizen journalism, school projects based on open source, social networks supported agriculture, initiatives for digital freedoms, new forms of financing, autonomous electricity production from renewable energy sources and open licenses for authors. Through presentations, discussions and workshops, it became clear that the Commons establish a sphere of organizing human activity characterized by the ability of people to manage resources within a framework of collective relationships and arrangements, and aimed at fair and equitable benefits from management of shared resources through the widest possible participation and self-government. – Access of civil society in public infrastructure of digital media (eg optical fibers), financed by national, public or community resources. The combination of the above can be a comprehensive proposal for decentralized organizational models of local communities, which will help their members to devise their own institutions for sustainable management of natural resources as Common goods through the reformulation of a quality that had always been, but forgot the last years: the ability to create and to share this knowledge creation. But the most important part of the festival was the presence of the participants, which turned the organizational difficulties of this effort into a real celebration, a promise that our needs can be a process of togetherness, a process of inspiration and creativity in a world where if there was not for the concept of cooperation there would be no life. We would like to say a big thank you to all those who have inspired us to perform CommonsFest. The Wikimedia Foundation and the communities of Wikipedia with the enormous task of creating an open collaborative encyclopedia. And finally the millions of people who dream of a more just and better future.